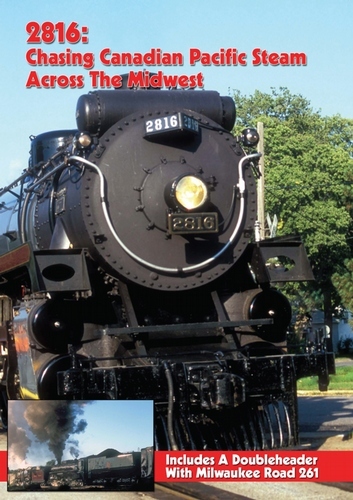 In 2007, Canadian Pacific steam locomotive 2816 traveled from its home in Calgary, Alberta to the US Midwest. This was only the second visit to the area following restoring 2816 to operation in 2001. Our coverage of this historic trip begins at the Canadian border at Noyes, MN as 2816 traveled to Minneapolis via Thief River Falls and Glenwood. We also accompanied 2816 to the Chicago area for high speed trips between Franklin Park, IL and Sturtevant, WI. After spending a few nights at Bensenville Yard, 2816 returned to Minneapolis. The route crossed Wisconsin to La Crosse, then followed the Mississippi River to the Twin Cities. Shorter journeys from Minneapolis included a day trip to Glenwood, MN where the engine was turned on a very old turntable, and a visit to Osceola and Dresser, WI. The highlight of the three weeks was the double-header with Milwaukee Road 261 along the Mississippi River to Le Crescent, MN. The two steam locomotives pulled a long train with no diesels or auxiliary tenders. Our coverage of this historic journey concludes with an all-day fast trip to Thief River Falls where we bid this beautiful 4-6-4 goodbye. Minimal narration - less talk, more steam action!